Hi. Love this site! I do have a question though. I being a dumbass bought the Blue Strawberry seeds for 10 bucks. I germinated about a 100 of them and so far in 3 weeks have 46 thriving little ones going. My plan is to grow them in pots indoors year round. Any great advice on this would be very much apreciated. Thanks to everyone out there who leaves their knowledge as well. Please share this with your friends and family! Then, follow the instructions on this page as closely as possible with your plants being indoors! Good luck! I have a great crop of plants but don’t have much fruit. Any suggestions? As long as you don’t get them wet, they should do reasonably well at room temperature for a few days before the farmer’s market. Picking every few days and then taking to market usually doesn’t allow time for mold or rot to set in as long as the fruits aren’t damaged in the picking process. Good luck! I have a wonderful crop of strawberry plants in a raised bed planter … the plants are productive … I have the plants in mounds protected with black polyethylene so no berries touch the soil. If you follow the attached link you will see that most berries have small black spots at the tip of them. I tried to embed a .jpg of the spots in a reply I sent to you yesterday. I don’t think it worked, that’s why I’m attaching the link to my personal web-page so you can see exactly what I’m asking. Do the spots mean the fruit is likely inedible? Those are edible. Most likely, that is the result of insect feeding. You might want to apply a liberal sprinkling of diatomaceous earth to see if that resolves the problem. Good luck! Sir Strawberry … I see these little black spots on the very end of my berries … if I consume them, will I perish? Thou shalt surely perish not. However, thine taste buds may perhaps disagree with the delectability of such parts. Thou shalt do best by excising said defects prior to inducing gustatory functions. Good luck! My strawberry plants have done really well, they have thrown out lots of runners that have bedded in over the winter. Should I cut them off and plant in rows or leave them to do there thing? If you are going for matted rows, I’d just leave them be. You’ll likely need to thin them after this season, or snip runners to keep them from becoming so dense that they compete for resources. That will make the strawberries be fewer and smaller. Good luck! How do strawberries affect Wisconsin? By making the communities happier as they consume the delicious berries. Good luck! Thanks for the information. I live in Uganda East Africa. I’m interested in growing strawberries commercially in greenhouses. What advice would you give me as regards the variety, risks and weather. If you can keep the temperature cool enough in the greenhouses, it might work. Your best bet is to find a source for plants somewhere on the African continent. It is notoriously difficult to get living plants shipped in from out of the country, and the varieties that grow true from seed have lower yields. Good luck! I made an incredible raised bed garden just for strawberry plants. The plants have bloomed and now the berrys are turning brown. What is the likely cause and is there a remendy for this situation? I have planted strawberry plants in a raised bed planter using organic soil … I am in central Florida and the plants are doing splendid, however, the berry turns brown and it appears as if the seeds on the berry fall off. I have found no reference to this situation in any websites I have perused. I’m hoping you can clue me in to whats happening, or at least give me the proper words for the obituary. It sounds like you might have a fungal infection caused by the organism Phytophthora cactorum. The fungus can cause both the fruit to turn brown and the seeds to fall off. Fungicides can be used to control it, but the fruits will likely uptake some of the fungicide (so you’ll end up consuming small quantities). The best way to prevent it is to make sure that your plants have plenty of air circulation, the soil is well-covered with clean straw so that rain doesn’t splatter soil/spores onto the plants/fruit, and make sure that the berries never rest directly on the soil. Good luck! I grow strawberry(bought from grocery) from seeds and now I have 9 saplings from runners of the mother plant. Will it bear fruit even if it’s planted on warmer topography, I’m in the Philippines. I’m growing it on our roof deck, the plants seems to be growing vigorously. Strawberry plants typically don’t produce as well in warmer climates. However, if you have the plants growing, go ahead and let them and see what happens. Good luck! My strawberry is flowering! Recently I pruned some leaves and runners, hoping it will induce blooming. Today, I notice one of my healtiest plant’s leaves are scorched(maybe b’cause of heat). I lift its foliage to see if there were further damage but then I saw…whoa! FLOWER BUDS! Although only a single plant is blooming, I am happy because I realized that it is really possible to grow strawberry on tropics. Just give it with proper care. Congratulations! Good luck, and keep us posted on how it goes for you! Thank you for this site. I bought Quinault ever bearing strawberries in August and transplanted them into containers. We got a few berries and then nothing for over a month. I thought they had gone dormant so I reduced watering and contemplated cutting the foliage but the leaves were so pretty that I decided against cutting. I didn’t know that my husband fed them with something that he makes for his plants that makes them flower and that’s why the foliage exploded I assume. Now it is November and the plants have many new buds and berries that I didn’t notice until now because the leaves had grown over them. Should I still be getting berries and should I snip the new buds or harvest them? I have never grown berries before so I appreciate the advice. Also I am in Las Vegas, NV. Thanks in advance. Everbearing varieties typically produce two harvests, one in the spring and one in early fall (with a few berries in between). If you live far enough south to allow the berries to ripen prior to the plants entering dormancy, I’d see if the fruit will beat the freeze. If the forecast for Las Vegas is calling for cold weather soon, I’d go ahead and snip the flowers as they are not likely to ripen quickly enough to harvest prior to entering dormancy. Good luck! I have been growing strawberries for 3 years. and now some of them have started to grow again. I live in Thailand. I get cool weather but it never freezes. Do strawberries need to go dormant? Strawberries are, by nature, temperate and much prefer a period of dormancy. However, they can be kept alive (as long as the temperatures don’t get too hot) without one. They will usually die more quickly without a dormant period, unfortunately. Good luck! I went to pick straw berries at the strawberry farm, got home, and most of the berries had a manure taste. How can I clean them, or should they be thrown out? If you rinse them thoroughly with water, that will usually remove any residue. If you want to be extra sure it is clean, you can use a fruit cleaner. Good luck! Pulling off the stalk and calyx often causes at least some damage to the strawberry itself. Additionally, pulling directly on the berry instead of severing the stem can also cause damage. Damaged berries rot and grow mold much more quickly than intact ones do. So, if you are picking and eating directly, it doesn’t matter. If you are going to be saving, transporting, using them to cook, etc., it is best to sever the stem/stalk and deal gently with the berry itself. Good luck! hi, i have a 2 year old garden , i havent allowed it to produce fruit , im ready to renovate it please help tnx? You’d need to supply nutrients and care according to the general information contained here. As far as wintering them goes, however, you’ll need to give them extra care. If you use troughs that can be detached/moved, you can simply dig a furrow in the ground when winter comes and place the trough in the ground before mulching heavily with clean straw on top of the troughs. Or, you can bring them into a garage and keep them against a heated wall of the interior. If you do the second, however, you’ll need to make sure you water periodically to prevent the soil from drying out completely. Good luck! Hi Mr. Strawberry, I have some wild strawberries that I grew from seed (from a kit that was distributed at work). I’ve been growing them for about 3 years. I’m just growing them for something to have in my office. But a question: the plants’ “dead zone”, which is startling to resemble the trunk of a palm tree, keeps on getting taller and lower leaves dies off and new growth continues from the top. Can I cut this down close to the soil and still have them live? My mission is not to bear fruit, it is just to have some greenery (although the plants do still flower and bear tiny fruit.) Thanks. Any brown or dead vegetative matter should be snipped and removed. 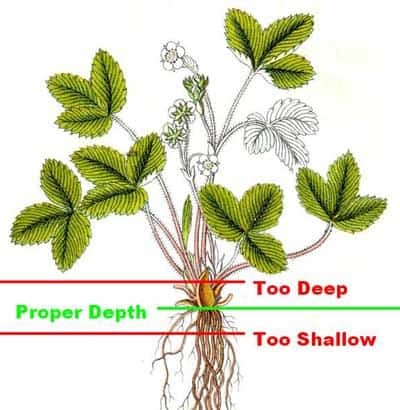 The crown of the strawberry plant, which will spread out just at soil level, should not be damaged or the plant can die. Good luck! I’m LOVING your site! So informative! I’m hoping you can help me with my very happy strawberry hanging basket. They are about 2 years old and I’ve honestly never done much with them other then letting them do their own thing. I’m much more prepared after reading your information! My question is, the plants are producing runners that have grown over the sides of the hanging planter and seem to be searching for ground. I have no idea what I should do to support these lil’guys and hope you can help me. Thanks so much! I’m glad the site has been helpful! 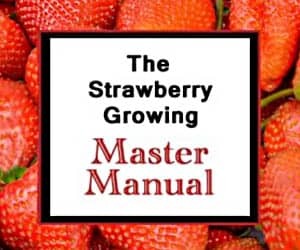 I’d recommend reviewing this information on transplanting strawberries. This information on growing strawberries in containers might be helpful also. Good luck! Greetings. I am a college student majoring in Industrial Design (think of it as product design). Currently, I am working on a studio project that is about food production and supply. We are to research a problem and then work on designing a product solution to address it. I have chosen to do my project on harvesting strawberries or other crops low to the ground. My main goal is to reduce back and joint pain for the workers picking the strawberries. I am trying to make it so they do not have to bend down as often. I have a few questions that I would like to ask for my advancing my research. I’m wondering if you would possibly be able to help or could you direct me to someone that could? 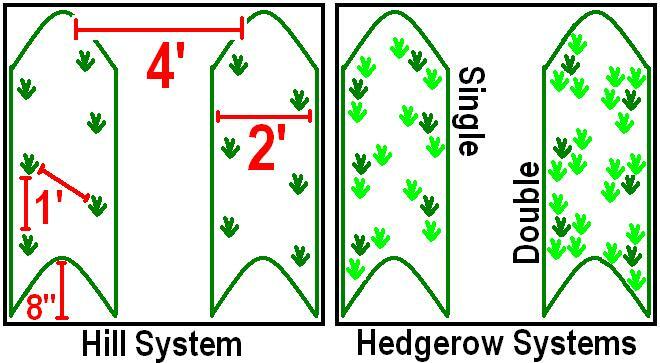 What is the typical distance between the rows of strawberries (this is referring to the width of the dirt path)? And then what is the distance from one end of the strawberry row to the other(this refers to the width of the row of strawberry plants)? What’s the average height that those rows with the fruit grow up to (how tall do the plants tend to grow)? Is there any way to differentiate the fruit from the leaves so that they are easier to spot? Like maybe an aroma, chemical marker, temperature, or other technology? Any information you could provide would be greatly appreciated. Thank you for your time. You can find the different growing methods that are commonly used on this page, along with spacing (also see the links toward the bottom that take you to the information about the plasticulture method). 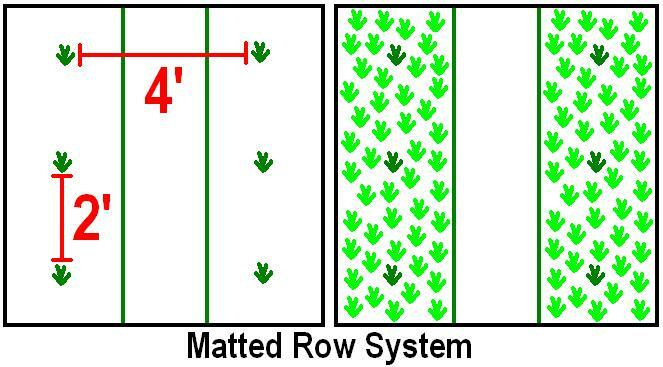 Row length is usually determined by the available acreage. Plants usually grow to around 1 foot tall, and, obviously, the easiest way to distinguish fruit from foliage is by color and size/shape. Aroma is also differnt, but it would be hard to detect such differences. Good luck! How can you tell the difference between runners and shoots that produce the flowers? I’ve been picking the runners early and I don’t want to pick off any flowering shoots by accident. The solons (runners) will have a leaflet at the end. The flower stalks will have a bud. Also, the runners are thicker than the flower shoots. Good luck! I have a strawberry bed, but it’s too late this year to renovate. I want to harvest plants and plant them next spring. How is the best way to do this? when do I harvest the plants? Is storing them in plastic bags in the refrigerator the way to store them? It is best to go ahead and re-plant any plants now. Storing them in the refrigerator will almost certainly allow mold/fungus to grow an kill the plants. Good luck! Hello. My wife has been building a box for some strawberry planters. We will be planting them in plastic planters surrounded by wood that has been painted/sealed. The finish on the wood is not suitable for vegetation, but it won’t be interacting with the soil. Our question is this: will it still be safe if the leaves and strawberries touch the wood box as long as the soil doesn’t interact with the wood? Thanks! Yes, that should be save. Very little, if any, passive transmission of chemicals from the painted/sealed wood will occur through the leaves. Good luck! Do strawberries continue to send out runners during the 2nd and 3rd year? Yes, the strawberries will continue to send out runners. Good luck! I think I didn’t make myself clear when I asked you the previous question. I meant to ask how to make dormant bare roots from my living plants. The easiest way is to wait until December or whenever your temperatures drop into the low 20s for a few nights. The vegetative foliage will wilt and/or drop off. When that occurs, the plant is usually dormant. Snip the stems from the top of the plant and carefully dig out the plant and its roots. Gently shake off the dirt from the plant. You can then store or ship them in that fashion as long as the roots don’t dry out completely. You can also induce dormancy by using refrigeration, but fungus is often a problem and a lot of plants are likely to die unless it is done just right. Hope that helps! Good luck! I think you have mentioned this before but I would like to learn a little more details how to prepare a dormant bare root strawberry like those that some vendors sell. Or let me know where to obtain the info. Here is how you can plant strawberry plants. Good luck!